power, and having an enchanting form with special parphernalia, manifestations and achievements by way of destruction of the forces of evil and enhancement of the forces of good. 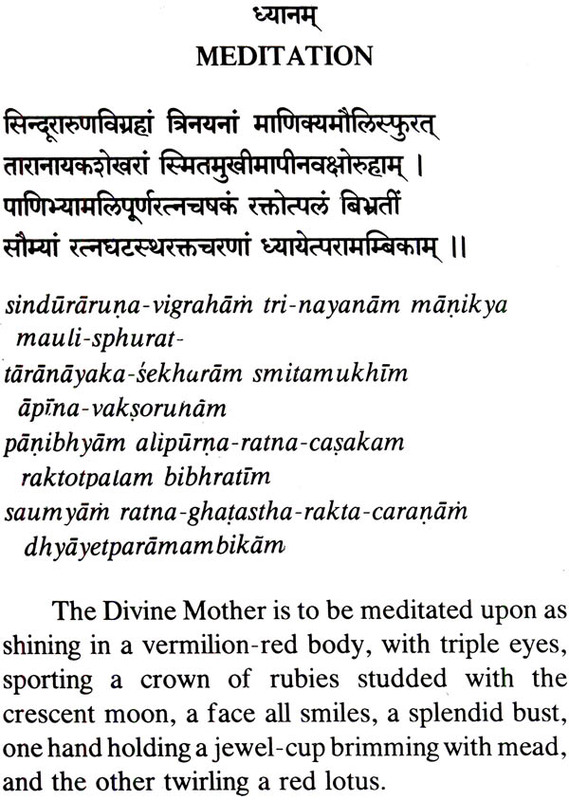 A word here about the philosophy of worship of the Divine as the Great Mother. To those brought up in Semitic religions, such a conception is wholly unacceptable. God can only be Father according to Christianity and the Great Creator according to Islam. They forget that all conceptions of the Deity in the human mind are anthropomorphic, and it is far more reasonable to conceive Him as Father - Mother than merely as Father. This is what the cult of Sakti has done. Siva is Pure Being and Sakti is Pure Will Each is a complement of the other and if separated completely from the other, both will be mere fictions. Together they are the Cosmic Whole and what transcends it. Though intellectually analysable, they are factually one. Sri - Cakra is a diagramatic representation of the Alogical Siva - Sakti, and Its cosmic manifestation, and Lalitambika, the central dot in the diagram is a more concrete form of It as divine Personality for adoration, praise and meditation. 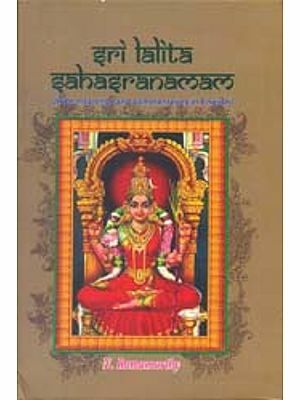 This Sahasranama is an important litany in the scheme of worship of the Supreme Power as Mother Lalitambika. The two Sahasranamas popular among devotees are the Visnu - Sahasranama and Lalita - Sahasranama. 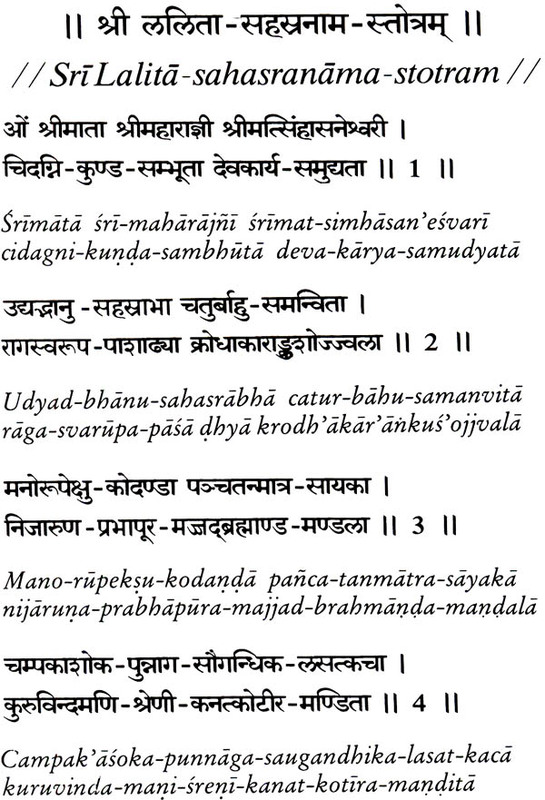 The first one occurs in the Anusasanika Parva of the Mahabharata and the second in Brahmanda Purana, Visnu - Sahasra - nama is the earliest of this kind of hymnology. Its style is epic and therefore simple, as it existed before the development of the ornate style of the Kavyas, which is reflected in Lalita - Sahasranama. This can be found from the number of syllable combinations in its words. 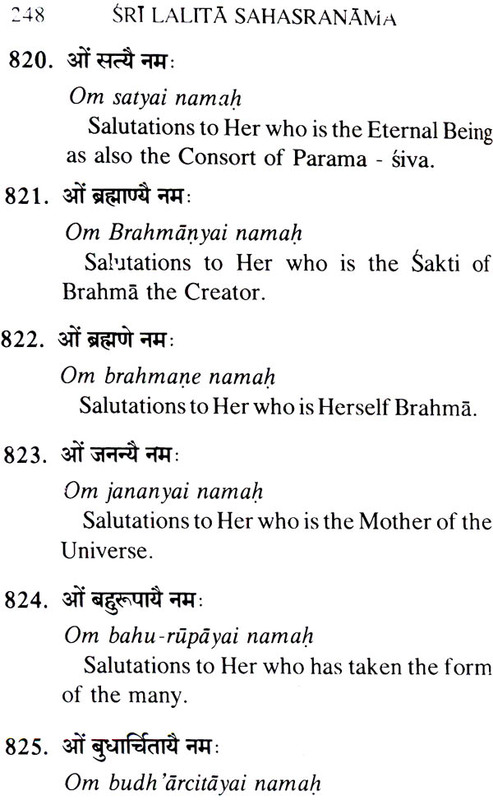 In the Visnu - Sahasranama the largest number of words are three syllabled. Their number is 338. Following it come 273 words of four syllables, 228 of two syllables, 106 of five syllables, 34 of six syllables, 18 of eight syllables, and 3 of single syllable. In contrast to this, the Lalita - Sahasranama has got 72 sixteen, syllabled, 242 eight - syllabled and 278 four - syllabled word combinations followed by 138 of three syllables, 122 of five syllables, 34 of six syllables, 7 of nine syllables, 3 of eleven syllables, 3 of twelve syllables, 2 of seven syllables, and 3 of a single syllable. 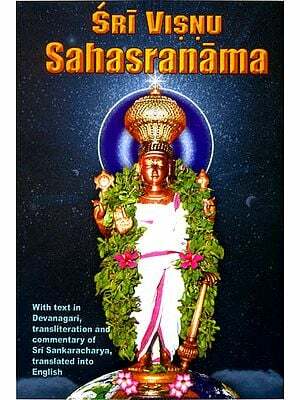 The length of the word combinations and the abundance of various forms of Samasa (compound words) and Alankara (figures of speech) are the characteristic of Lalita - Sahasranama whereas the Visnu - Sahasranama is noted for its verbal austerity and lack of embellishments. 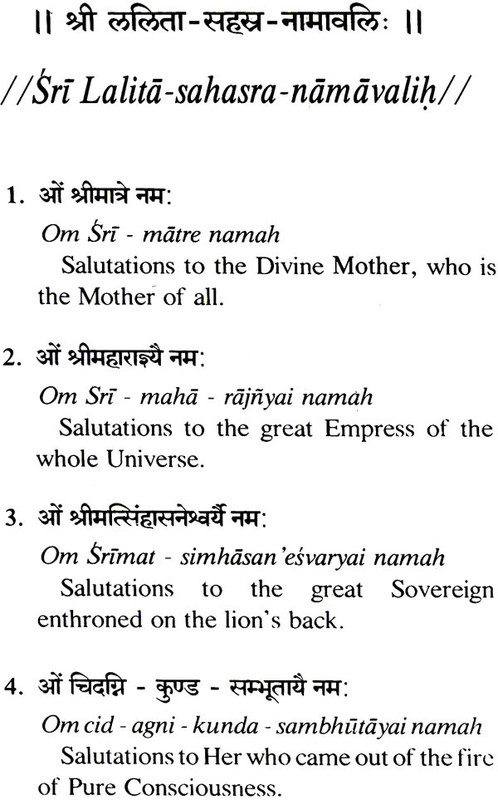 Extensive alliteration in the beginning of words is a common feature of all Sahasranamas. Visnu-Sahasranama does not attnbute any particular abode to Visnu. He is the Indwelling Spirit in all beings, and the whole cosmos constitutes His body. 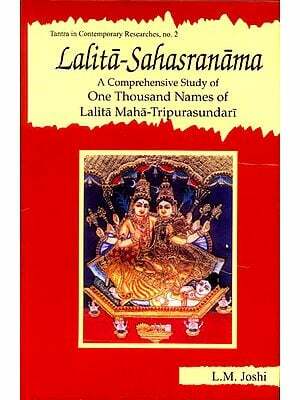 But the Lalita - Sahasranama gives several abodes to the Mother like Cintamanigrha, Jalandhara, Kadamba-vana, Malayacala, Mahakailasa, Vindhyacala, group of fifty Pithas etc. The description of the form of the Deity is very much anthropomorphic giving as it does detailed descriptions of the various parts of the body. In Visnu - Sahasranama bodily description is marginal only, just to show that besides being the all-pervading spirit, Visnu is a Personality too, but there is nothing in it to equal the description of the enthralling beauty of Lalitambika. In the Lalita various exploits of the Devi like the destruction of Bhanda are given in the beginning itself. The Visnu, though it refers to the Avataras, never gives any description of their exploits. It is concerned more with the attributes of the Divine. 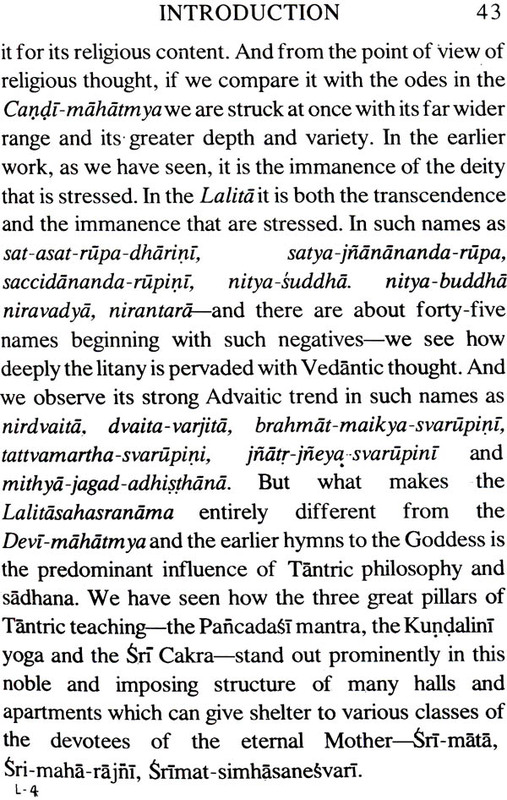 Unlike the Visnu, the Lalita gives elaborate references to ritualistic worship like Sri-Cakra Puja, the paths of Samaya and Kaula and other details of the Mother cult. 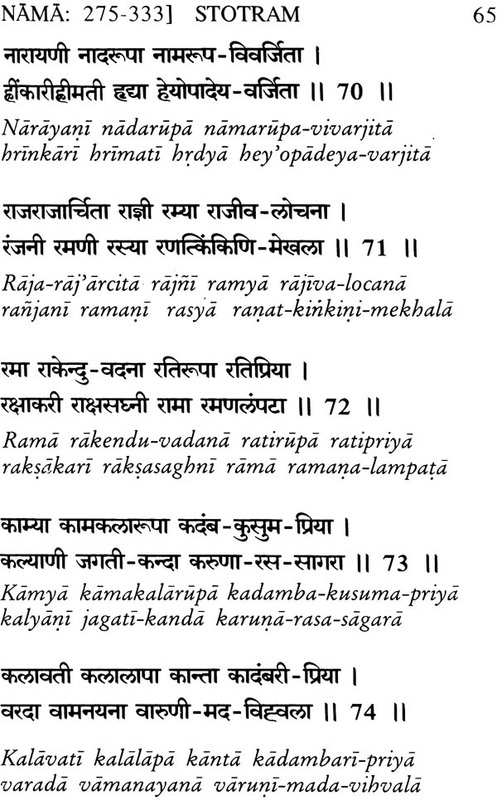 The chanting of this Sahasranama is made the concluding part of the Sri-Vidya Upasana, which includes also the repetition of Pancadasaksari mantra and Sri-Cakrapuja. But for those who have no competency and facility to observe all the three, chanting the Lalita - Sahasranama alone is considered sufficient. It is declared by Hayagriva, while imparting this litany to Agastya, that the recital of it with faith and devotion, accompanied with offerings of fragrant flowers on the Sri-Cakra, is the best means for man to attain all the values of life. Those who have particular wants and desires are thereby enabled to get the fulfilment of them by the grace of Lalitambika. It cleanses one of sins, gives protection from enemies and from all kinds of dangers including the effects of black magic, cures serious ailments, bestows prosperity and progeny, endows one with the power of attracting others and exercising control over them, and enhances one's literary and poetic aptitudes. It is finally said that one who recites this Sahasranama out of pure devotion to the Divine Mother, without any desire for worldly fulfilments, will attain the knowledge of Brahman and release from involvement in the cycle of births and deaths (Samsara). A critical person may doubt whether all these hyperbolic attainments mentioned in the Phala-Sruti (the panegyric of accruing benefits) are really attained. That will depend on one's unwavering faith and devotion. Besides, such declarations alone can attract the materially - minded man to the path of devotion. 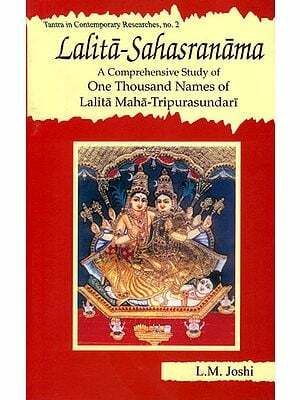 The Lalitasahasranama is a sequel to the Lalitopakhyana which forms part of the Brahmanda Purana. It consists of three chapters. The first is only introductory, the second gives the thousand names of the great Goddess Lalita and the third contains the usual phalasruti. ‘‘You have narrated to me the most wonderful history of Lalita Devi. You have narrated in detail the birth of the Mother, then her coronation, and then her slaying of the demon Bhanda. You have described Sripura . in all its glory and also the greatness of the Pancadasi mantra ... 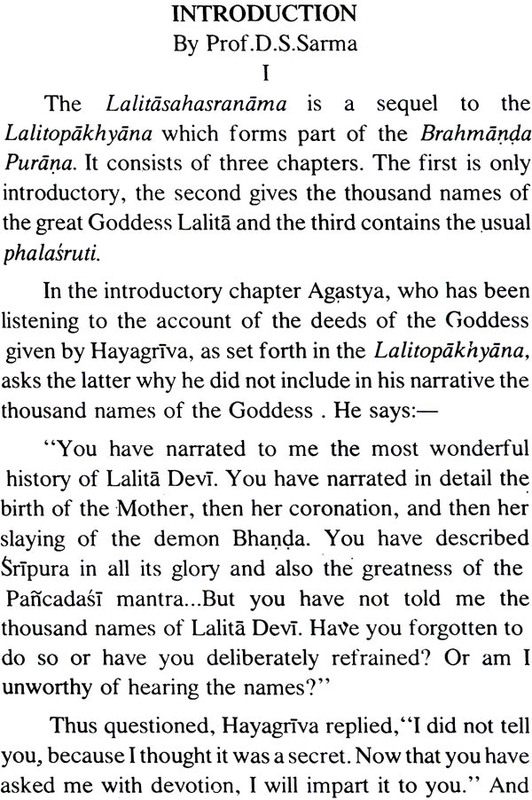 But you have not told me the thousand names of Lalita Devi. Have you forgotten to do so or have you deliberately refrained? Or am I unworthy of hearing the names?" Thus questioned, Hayagriva replied,' 'I did not tell you, because I thought it was a secret. Now that you have asked me with devotion, I will impart it to you." And then he gave him the thousand names, saying that they had been composed by the Goddesses of speech at the express command of Lalita Paramesvari Herself. When Manmatha, the god of love, was reduced to ashes by Siva opening his third eye, the ashes were collected by Citrakarman, one of Siva's attendants, and used for drawing the figure of a man. Siva glanced at the figure and at once it leaped into life and became a living person. The artist now advised the 'person he thus created to pray to Siva and repeat the Sat a - Rudriya. The person did so and Siva was pleased and blessed him with the overlordship of the world for sixty thousand years. On hearing this, Brahma cried in dismay, "Bhand, Bhand,’’ and so the person came to have the name Bhanda. When Bhanda grew up, he became a great Asura and established his capital in Sonitapura. He oppresssed the gods and made life intolerable for them. Thereupon Narada advised Indra, the king of the gods, to do penance and seek the help of Para Sakti, lndra, accordingly, performed a great sacrifice, and out of the sacrificial fire there arose a great Cakra and, in the midst of it, was the lovely figure of the Devi who embodied I the spirit of the Trimurti. The gods praised her and she promised to vanquish their enemy Bhandasura. But Brahma said that no person who remained single was fit for sovereignty according to the scriptures and exhorted her to choose a suitable mate. The gods commended the proposal and assured her that her independence would in no way suffer by her marriage. Then the Goddess consented and threw up a garland. It fell round the neck of Siva who had assumed the lovely form of Kamesvara. The marriage of the beautiful couple was celebrated by the gods with great pomp and Lalita became Kamesvari and was crowned along with her husband. After the gods had left, the Goddess set out to fulfil her mission with an army of Saktis well equipped with chariots, elephants and horses. The battle between her and the demon raged for four days andat last Bhanda was killed with all his kinsmen and followers, and his capital was razed to the ground. The gods praised the Goddess and requested her to take pity on Rati, the wife of Manmatha who had been burnt to death by Siva. She consented and revived the god of love and then went and settled down at Srinagara. This city was built for her by both Visvakarma and Maya on one of the peaks of Mount Meru. An elaborate description of it is given in the Purana. In the midst of this wonderful city is a palace built of precious Cintamani stones and in the centre Of the palace is the seat of the Devi. On a jewelled cot, the legs of which are formed by Brahma Visnu, Isvara and Mahesvara and the coverlet by Sadasiva, the great Goddess Sri lalita Devi sits in the lap of her husband, Kamesvara. The Sricakra is, beside: other things, a diagrammatic representation of the Goddess and her capital Sripura. 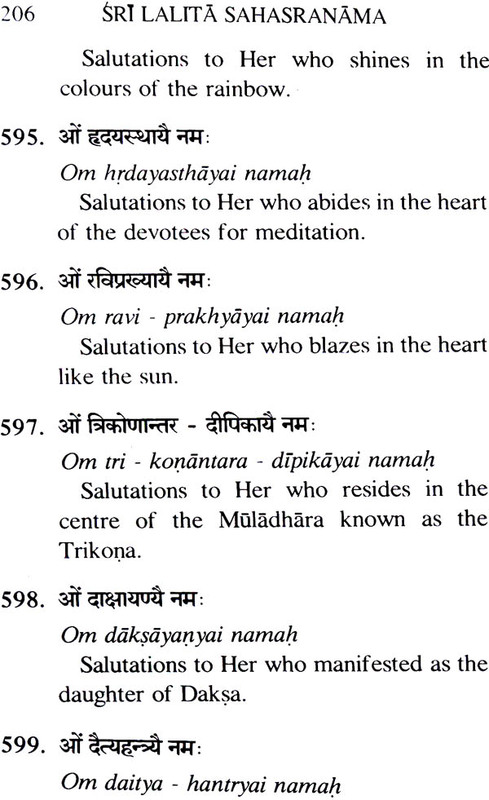 Devotees of the Goddess are therefore exhorted to worship the Sricakra perform japam with the Pancadasaksari mantra which forms the subtle body of the Devi and repeat this litany of a thousand names, which was composed by the Goddes- ses of speech at the' express command of Sri Lalita Pararnesvari herself.